Through this April 30th a huge selection of my paintings on paper and panel is on display at Karis Art Gallery on Hilton Head Island, South Carolina. You can read the press release for this show, titled SURFACING, here. For those who are interested in my artwork but find themselves unable to travel to the Lowcountry, I thought I’d take this opportunity to create a virtual gallery of the twenty-five paintings currently hanging in the gallery. This doesn’t include nearly fifty original works on paper on display, so if you want to get the full effect, you really need to be there. That said, I hope you enjoy the following images, which are currently on sale here and are shippable anywhere. In addition, an array of prints and other merchandise featuring all of these paintings and more is available here. 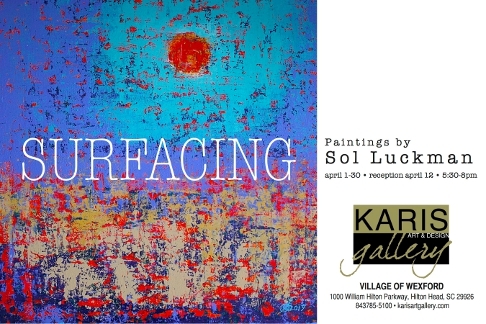 If you do happen to be near Hilton Head Friday, April 12, please swing by Karis Art Gallery between 5:30-8:00 pm for my reception and introduce yourself. That day, and that day only, you can save 10% on any of my original paintings for sale in the gallery. You can purchase them from anywhere in the world by contacting Karis Art Gallery. Thanks for browsing. Hope to see you at my reception! 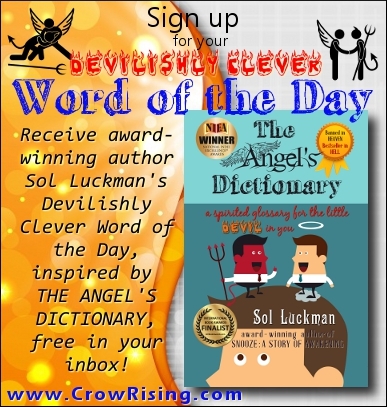 Sol Luckman is a pioneering painter whose work has been featured on mainstream book covers and award-winning author whose books include the international bestselling CONSCIOUS HEALING and its bestselling sequel, POTENTIATE YOUR DNA. His visionary novel, SNOOZE: A STORY OF AWAKENING, winner of the 2015 National Indie Excellence Award for New Age Fiction, is the coming-of-age tale of one extraordinary boy’s awakening to the world-changing reality of his dreams. 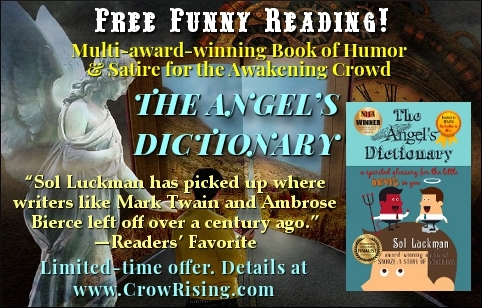 Sol’s latest book, THE ANGEL’S DICTIONARY: A SPIRITED GLOSSARY FOR THE LITTLE DEVIL IN YOU, winner of the 2017 National Indie Excellence Award for Humor, reinvigorates satire to prove that—though we might not be able to change the world—we can at least have a good laugh at it. Then again, maybe laughter can transform the world! Learn more about Sol’s art and writing at www.CrowRising.com. Was Historical Russian "Apewoman" Really a Sasquatch?